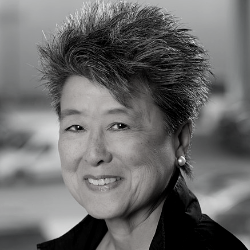 Helen Zia is a writer, community activist, and Fulbright Scholar. She spent 12 years researching and writing Last Boat out of Shanghai, visiting China, Hong Kong and Taiwan on numerous occasions. A longtime journalist, she is also the author of Asian American Dreams: The Emergence of an American People. She coauthored, with Wen Ho Lee, My Country Versus Me, which reveals what can happen to Chinese Americans who are falsely accused of being a spies for China. She was Executive Editor of Ms. Magazine and her articles, essays and reviews have appeared in numerous publications, books and anthologies, receiving awards for her ground-breaking stories. The daughter of immigrants from China, Helen’s work on the 1980s Asian American landmark civil rights case of anti-Asian violence is featured in the Academy Award nominated documentary, Who Killed Vincent Chin? and she was profiled in Bill Moyers’ PBS series, Becoming American: The Chinese Experience. In 2008 Helen was a Torchbearer in San Francisco for the Beijing Olympics amid great controversy; in 2010, she was a witness in the federal marriage equality case decided by the US Supreme Court. Helen is a graduate of Princeton University’s first coeducational class and received an honorary Doctor of Laws degree from the Law School of the City University of New York. She attended medical school but quit after completing two years, then went to work as a construction laborer, an autoworker, and a community organizer, after which she discovered her life’s work as a writer.